Many scientists believe that certain dinosaurs called the theropods were the earliest ancestors of modern birds and that bird evolution commenced in the Jurassic Period. No, those great big Pterodactyls and Pterosaurs you remember in all of those great dinosaur movies were NOT early birds, nor were they flying dinosaurs. As a matter of fact those Jurassic reptiles are not considered to be on the evolutionary path to birds at all but were separate flying or soaring reptiles. Ancient reptiles also included the Archosauria, which included the dinosaurs and the pterosaurs (flying reptiles, not dinosaurs). Figure 6.68: Reptiles (green field) comprise all non-avian and non-mammalian amniotes. This diagram illustrates the evolutionary connections between birds and reptiles. So, dinosaurs are a type of extinct reptile, but are the favored ancestor of modern birds. Not all prehistoric reptiles were dinosaurs. The four orders of living reptiles all have extinct members. Turtles and crocodiles arose 220-215 mya (million years ago) and were contemporaries of the dinosaurs. Looking at all of the fossil records and theories available at the time, Harry Seeley published a paper in 1888 that divided the dinosaurs into two major groups based not on dentition or diet but on hip structure. The two groups were: saurischian or “lizard-hipped” dinosaurs and the ornithiscians or “bird-hipped” dinosaurs. Just to confuse the unwitting, it is the lizard-hipped dinosaurs that gave rise to modern birds NOT the bird-hipped dinosaurs. The lizard-hipped dinosaurs were divided roughly into the sauropodomorpha – four-legged plant-eaters – and the theropods, the two-legged carnivores. In a nutshell, theropods are classified as bipedal (walking on two legs rather than four) saurischian (lizard-hipped) dinosaurs. And they are believed to be the ancestors of birds. Famous theropods we have known and feared include Tyrannosaurus rex and the velociraptors. Next time you hold a robin or chickadee on your outstretched finger, take a moment and think about it…. For quick info about dinosaur classification geared to elementary students, REVIEW How Are Dinosaurs Classified? from EnchantedLearning.com. Figure 6.69: This timeline illustrates the early history of some of the predecessors of modern birds, or class Aves. Birds are categorized as a the biological or taxonomic class Aves. 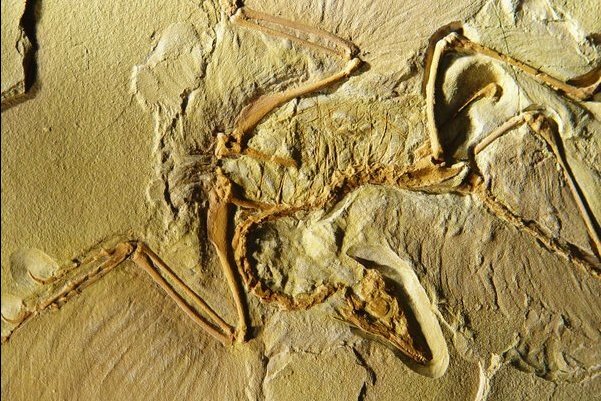 The earliest known species of class Aves is Archaeopteryx lithographica, which lived in the late Jurassic period- about 145 million years ago. Based on fossil records it was the size of a modern Magpie. It truly appears to be an intermediary between dinosaurs and birds. Unlike modern birds, but VERY much like theropod dinosaurs, it had jaws with sharp teeth, three fingers with claws, a long bony tail, hyper-extensible second toes (“killing claw” – again, think velociraptor), and various skeletal features like a furcula (wishbone). 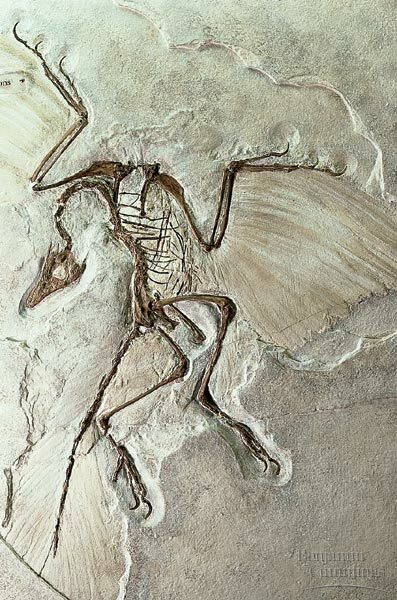 Figure 6.70: This Archaeopteryx specimen is only slightly dissociated and very complete on a single limestone slab. In addition to exquisitely-preserved bones, the impressions of both wing and tail feathers are present. Figure 6.71: A second Archaeopteryx specimen clearly shows both wing and tail feathers.